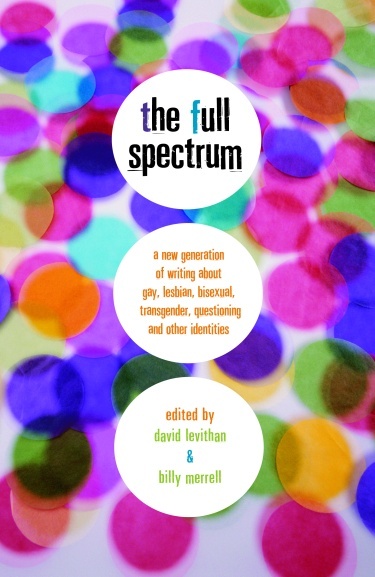 Editors David Levithan and Billy Merrell are searching for non-fiction entries to include in the upcoming expanded edition of The Full Spectrum, with an emphasis on diversity. The deadline for submissions is August 1, 2015. Submissions without this information will not be accepted. Email your submissions as an attachment to submissions@queerthology.com, and include the above required information at the top of the document. Formatting guidelines are specified below. Due to time restrictions, we are not accepting submissions by mail. All entries must be emailed by August 1, 2015. There will be no exceptions made to this deadline. Submissions can be no longer than 3,000 words (approximately ten double-spaced pages). Graphic and photographic works will also be considered. Limit visual entries to 10 pages. The title of each work and the contact information should appear at the top of the first page. Do not use a separate title page. All entrants must be 21 years old or younger as of January 1, 2016, and all submissions must be works of nonfiction concerning LGBTQI+, and/or other related sexuality issues. Be sure to keep a copy of your manuscript. Due to the volume of entries received, manuscripts cannot be critiqued or returned. Authorship & Plagiarism: All work must be executed by the submitter. By applying to be in this anthology, each submitter undertakes to present an original work (i) that has been created solely by the submitter and (ii) that does not infringe upon the intellectual property rights of any other individual or entity. Previous Publication: The copyright to each submission must be owned by the writer. If the submission has been previously published in a local, high school, or college publication and the author has retained the rights, it can be submitted to the contest. If the submission has previously been published in a national publication (circulation over 10,000) or in book form, it should not be entered for this anthology. If there is a question about whether your entry qualifies, please direct it to the editors. Multiple Entries: Each writer may submit up to three entries to the anthology. Only one winning entry per writer will be permitted. Notification of Winners: Winners will be notified and posted on the queerthology.com website no later than September 30, 2015. Unfortunately, we cannot notify writers whose submissions are not accepted. Due to the large number of entries, manuscripts cannot be critiqued or returned. Please, be aware that, because of the large number of entries we receive, we cannot verify the status of any entries at any point in the process. Winning entries will appear in an expanded edition of the anthology The Full Spectrum: A New Generation of Writing about Gay, Lesbian, Bisexual, Transgender, Questioning and Other Identities, which when published by Knopf (projected for Summer 2016). Each winner will be paid $150 their work and will need to sign a contract prior to publication. Copyright to the work will be retained by the writer, with exclusive license given to the anthology to use, publish, or display the work in the world territory for a time period to be specified in the contract.